The Fraser River Canyon near Siska Flat taken from the Trans-Canada Highway 6 miles south of Lytton, north of Kanaka Bar about 120 miles northeast of Vancouver. The line on the right is single track and the second line is Cisco Siding. 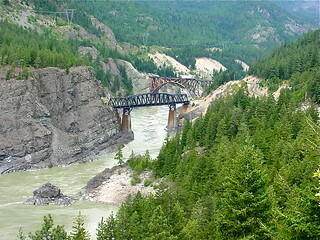 The canyon's southern stretch is a major transportation corridor to the Interior from the Coast at Vancouver and the Trans-Canada Highway is carved out of its rock faces. There are no trains in the view but both the Canadian National and Canadian Pacific Railways share the gorge with the highway and switch banks crossing the gorge on impressive railroad bridges. The CPR line was opened after great difficulties, engineering & financial, in 1885 while the CNR (ex-GNoR) opened in 1915. The CNR line was mainly located on the "wrong" western side of the river where construction was even more difficult.